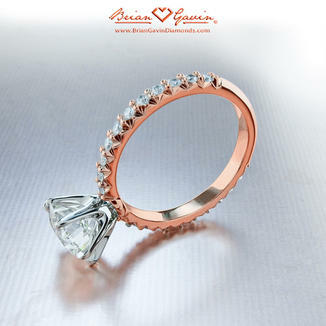 18K Rose Gold Six Prong Fishtail Pave, Engagement Ring | Pave & Side Stones Diamond Ring. Our popular 3/4 eternity fishtail pave setting featuring 26 Brian Gavin Signature melee F/G VS approx 0.42cts with the Classic Style 6 prong head. 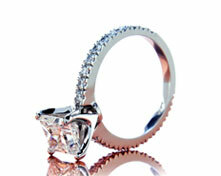 Price is for setting only for diamonds up to 2 carats. Add $100 for diamonds larger than 2 carats. 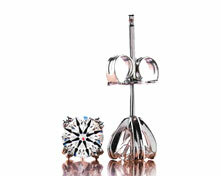 Select your diamond from our online inventory. 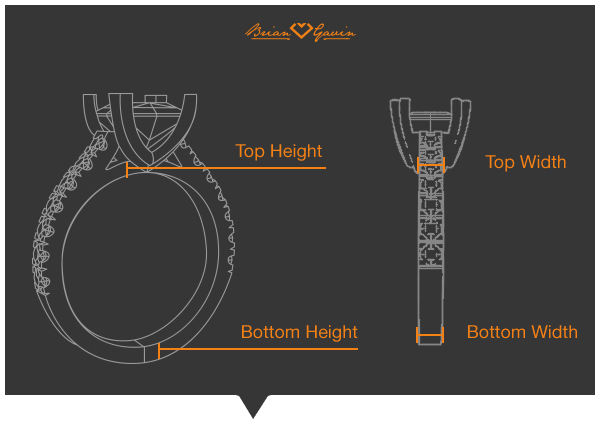 Matching Fishtail Pave Band is #5477. By Rebecca Douglas on May 27, 2017 Beautiful ring. The accent diamonds are very white, bright and sparkly. By Natasia Kaigler on November 14, 2016 The diamonds sparkle. I have to honestly say that i wish I had chosen a different setting. But that is no fault of BGD. I would have chosen the Anita Halo if I had known how white the stone showed. I should have asked. That is my own fault. NO way I am sending it back and waiting weeks for it to be changed. I loved my ring. I think I would have loved it more, though, if it were the Anita.